After over ten years of trying it has finally happened: Osama bin Laden – the face of terror for many westerners and the undisputed hide & seek world champion – has been killed by US special forces. This of course is a major success for US military and intelligence because for long it looked as if Osama would stay hidden from the largest war machine in the world forever. The price for his death has been huge: Two wars, two wrecked countries and over 4000 dead coalition soldiers. Osama bin Laden and the “war on terror” he started has cost the US more in military spending than the Soviet Union. And the fact is that this does not do as much to stop terrorism as one might think. 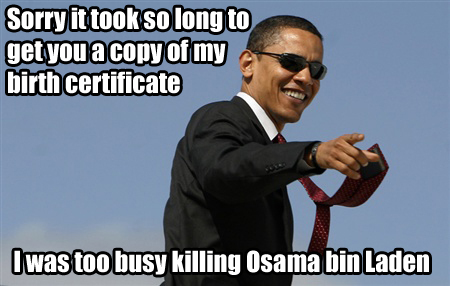 Bin laden has not been operationaly active for years. He hasn’t done anything except provide moral support and funding. Al-qaeda is a very loose organization, many of its branches being part of “Al-qaeda” in name only and there are many other terror organizations not connected to Al-qaeda. This is a major moral victory but they key word here is moral. The man has become a legend amongts jihadist and he has started a cult following which will not die with him for sure. So, in light of that realization it is somewhat funny to hear the word “justice” being thrown around in almost every interview and speech in the news. Justice for whom? The friends and relatives of the victims of 9/11? Maybe but it is more just plain old revenge than justice because the problem that caused the 9/11 – fundementalist terrorists – is still there. I do have to congratulate president Obama though because he did in less than 4 years what his predecessor couldn’t do in 8 years. All this being said the death of Bin Laden is undoubtedly a good thing despite of how much it will actually achieve in terms of defeating terrorism because the man stood against the values and ideals that all rational people hold dear. I am not sad to see him go, quite the contrary; the world is a better place without scumbags like him. Hasta la vista, baby! This entry was posted on May 2, 2011 at 14:25 and is filed under Al-qaeda, Conflicts, Terrorism with tags Osama bin Laden. You can follow any responses to this entry through the RSS 2.0 feed. You can leave a response, or trackback from your own site.